I will be out of my sewing room for a few days, so I thought I better finish the floral pet quilt. This was a fun quilt to make because I designed it as I went along. Following the project process posted by Melanie of Catbird Quilt Studio, helped in making this an enjoyable project. Thanks again, Melanie! I made heart blocks for the corners. One of my friends and I are making blocks from the book, Modern Blocks, compiled by Susanne Woods. We take turns with another friend, choosing a block to make for the month. Making the floral pet quilt has left me with polka-dot-on-the-brain. I used my leftover polka dot fabric, and the Kaffe Fasset remnants, to make the block chosen for March. Lynn, my pottery instructor, was nice enough to add an extra day to my classes. I ran out of time on my last of four classes, and was not able to paint the crazy bird bowl. I painted and glazed it today, and I cannot wait to see it when it’s done. I picked up my other clay creations. They are silly pieces, but they were so much fun to make. I realize that pottery is not my thing, so I will not be signing up for another class. I did enjoy the process. I am very happy that I found such a great clay studio. The owners, the instructors, and the potters at the Sunin Clay Studio are super friendly and helpful. This is Fat Cat…inspired by daughter-in-law’s cat, Richard Parker. Now, I need to get back to fixing the polka-dot border on the floral pet quilt. No more procrastination. I have already made most of the squares that I will be piecing on the border. Today has been both a productive day and a day of procrastination. The productive part of the day started with my fourth class at the Sunin Clay Studio. I was able to paint and glaze four of the five clay products that I made. On Tuesday, I will go back to paint and glaze the wonky bird dish I made. I was happy to see that it stood the test of time;and the heat of the kiln. I was concerned about the head falling off. I was also concerned that the legs might be too wobbly. As much as I enjoyed this clay class, I do not think I will be signing up for another any time soon. The afternoon was also productive in that I worked on a small fabric pouch. I’m in procrastination mode when it comes to fixing the floral pet quilt block. The block has polka-dots that bled on the very corner of two strips. There is no motivation at this point to rip out the block, and add two new sides. Maybe tomorrow. I hope you had an enjoyable Saturday. It was a gray and misty day today. I spent the morning watching a Janette McDonald and Clark Gable movie. (Yes, I am a nerdy fan of classic movies). Then I got back to work on the floral pets quilt. I started by blocking the strips of Flying Geese blocks that I had prepared yesterday. Then I set the strips in place on the design wall. I tried three different layouts. I would set up a layout, walk by it every now and then, and think about it. After a few hours, all I saw was polka-dots. So, I took some pictures and sent them to my sister, Emma. She is my second set of eyes whenever I get stuck. Once I chose the layout, I started sewing in the Flying Geese. I had difficulty with figuring out how to press the direction of the seams, but I finally figured it out. Of course, there were a few rip outs that had to be redone. I had a Netflix movie on while I was sewing and I got distracted enough to sew the FG in the wrong direction, more than once. Note to self: Don’t watch movies and sew at the same time. I had not had any problem with pressing with steam, but the starch did cause one small corner of a black on white polka- dot to bleed. Since I have had my fill of rip and redo for the day, I am leaving the quilt top on the design wall for now. I will decide on whether to replace the one strip or just leave it. The bleeding is barely noticeable…but it is visible if you look closely. And I know it is there. My plan for tomorrow afternoon is to design a final border. I am thinking of 4 inch blocks…maybe a four patch and some simple heart blocks. Or, maybe I will just make strips of the floral Kaffe Fassett that I have left over. I think I have enough. After making my first three quilts back in 2014, I thought I was ready to step up my game with a more difficult type of block. I chose a quilt pattern with flying geese…big mistake. After flubbering through three blocks, I threw the blocks and fabric in a UFO bin, where portions of it still reside today. I started using the fabric for other quilts, and I promised myself never to make Flying Geese again. I now, no longer shy away from Flying Geese. I studied different tutorials and learned how to use the No-Waste method. I thought the Floral Pets quilt could use two columns of Flying Geese, so I brushed up with more tutorials. Since I am making the block with scraps, I had to make sure I had enough of certain colors to repeat a pattern. I made a few FG blocks just to see how they would look with the pet blocks that I already framed with two borders. As I made the FG blocks, one at a time, I realized that I would not use the No-Waste method… and still not waste the triangles that are trimmed. I started making 11/2 inch blocks with the triangles. There are different possibilities for using these HST in other projects…or maybe not. Anyway, it was fun making them along with the Flying Geese. These small HST blocks could make interesting border strips or large squares. I still have 21 more FG to make. Taking a break for now. There is so much information, and so many wonderful people in the blog world. For the past week or so, I had been stuck in the creating process. In my usual unorganized manner, I looked through Pinterest, viewed tutorials, pulled books and magazines…and got nowhere. Then I visited with quilters and associates at the Mesquite Bean Quilt Shop. I purchased the Floral Pets fabric, but still had no real plan. I just knew that I wanted to do something different than the free pattern. That’s where Melanie McNeil enters the picture. I read her post, Project Process, and that was the jump start I needed. Each step of the process got me closer to visualizing what I wanted. I am now “executing chosen solutions”. Thank you, Melanie! Right now, it still looks pretty traditional. My plan is to jazz it up…somehow. I need to repeat steps 1-3! I have been trying to figure out what I want to do next. 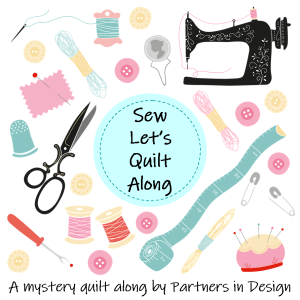 I have a long “Someday” list, and I have been studying tutorials in preparation for some of these small quilting projects. It had been a while since I visited the Mesquite Bean, so I grabbed my shopping bag and headed out. I had some errands to run after a hectic morning, so I knew a trip to the fabric shop was just what I needed. I knew that on Tuesdays, the store opens up the back room for a sew along. The shop was humming with activity, both in the store front and in the back room. I shopped around for some fat quarters, then I found two cute panels called Floral Pets. One of the super helpful associates, Mechelle, told me that the ladies in the backroom were all making quilts with a pattern that used these panels. The pattern was designed by Mary Kay Davis for Thread on the Floor. It is a free pattern that can be found on Blend fabrics. I meandered my way to the backroom and was immediately welcomed by all the quilters. What I found interesting, was that each person was working from the same pattern, yet each quilt was different. Some just made a dog house quilt. Some just made a cat in a basket quilt. Some made it wider, others made it longer. They used the same suggested fabric, but utilized it in different places. I apologized for being nosy and asking dumb questions. One of the quilters reassured me that there is no such thing as being nosy or asking dumb questions when talking with quilters. Each one shared their techniques for adjusting to the different sizes of the the individual panels. I also learned ways to problem solve other technicalities. When I said I was thinking of making a quilt using both the dog and the cats together, some of them said they wished they had thought of that. The suggested coordinating fabrics are pretty, but they are a little too pastel for me. I held the panels next to some Kaffe Fassett floral and polka-dot prints. I loved the way the bold colors made the pastel floral pets pop out. I have some good remnants of the Kaffe Fassett polka dots, so I just bought some floral designs and some white and black polka-dot fabric. I am going to play around with this a bit. It is so much fun to meet and share with other quilters. There is always something new to learn.